We agree with Warren Buffett that the distinctions between growth and value investing are irrelevant. Value without growth offers limited upside, while growth without value offers no investment merit. The best investments, as Buffett would go on to write in his letter above, offer both growth and value by employing large amounts of new capital at a high return on invested capital (ROIC). Following these principles, we’ve identified a company with a high ROIC, double digit revenue growth, and it just so happens to be a stock that Buffett himself has been buying recently. With strong fundamentals and cheap valuation compared to its peers, Synchrony Financial (SYF: $35/share) is our Long Idea this week. SYF is the largest provider of private label credit cards. It partners with retail giants such as Walmart (WMT), Lowe’s (LOW), and Amazon (AMZN) to provide consumers with store-branded credit cards. These private label cards tend to have higher interest rates than a normal credit card, and SYF’s net interest margin of 16.1% is much higher than Capital One (COF) at 6.8% or Discover Financial (DFS) at 10%. The high net interest margin helps SYF earn a high ROIC. While the company’s ROIC declined in 2015, it’s moving back in a positive direction, and increased from 16% in 2015 to a top-quintile 18% over the last twelve months. As Figure 1 shows, SYF has also managed to grow after-tax profit (NOPAT) by 7% compounded annually since 2012. We were bullish on SYF when it first went public with the spin-off of General Electric’s (GE) consumer finance unit in 2014 and its strong fundamentals now earn SYF a Very Attractive risk/reward rating. 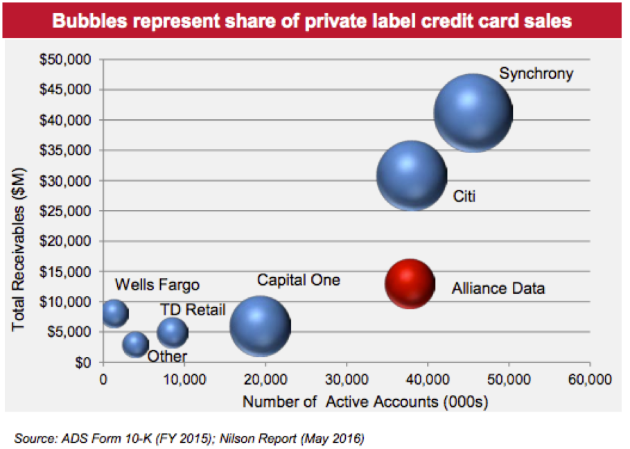 SYF is the biggest player in the private label credit card market in terms of both number of active accounts and the dollar amount of transactions. Figure 2, which comes from competitor Alliance Data Systems (ADS) investor presentation, shows SYF’s position in the industry. That scale provides a built-in advantage for SYF as it seeks to obtain new business and get the most value out of its existing customers. More customers and more transactions leads to more data, which SYF can then leverage to more effectively market to consumers. A recently announced $6.8 billion deal (34% of invested capital) for SYF to acquire PayPal’s (PYPL) consumer credit receivables and an interest in other PayPal receivables held by other investors. In addition, SYF will be the exclusive provider of PayPal credit for the next 10 years, which means it will continue to thrive even if online shopping cuts into the business of its brick-and-mortar partners. The rise of mobile payments, which will make it easier for consumers to utilize more private-label cards. Physical credit cards take up space and can make a wallet uncomfortably bulky, but digital wallets can contain as many different cards as a consumer wants. The rise of AI and machine learning. As retailers begin leveraging these new technologies to increase their efficiency, the data SYF collects from consumers will become even more valuable. With consumer credit growing at a steady pace, SYF should continue to grow revenue and NOPAT for the foreseeable future. Deterioration in credit quality – Charge-offs have been trending slightly up in recent months, so this is an issue to keep an eye on, especially with the PayPal deal. PayPal’s credit users have an average FICO score of 682, below SYF’s 714, so there is a risk that these loans could default at a higher rate. Economic recession – When people lose their jobs or have their wages cut, private label cards tend to be the first debts they stop paying. While we believe the long-term prospects for SYF are good, it would almost certainly underperform the market in the event of a recession. Hacking – SYF would obviously suffer from a hack of its own data, but even other hacking instances in the industry can cause problems. Hacks can cause consumers to lose trust in financial institutions and freeze their credit, which makes it difficult to sign up new customers. These are real risks that investors should take into account when considering SYF as an investment. However, we believe the potential rewards outweigh the risk. Most importantly, the risks above are already factored in to the valuation and provide an attractive risk/reward trade-off. Despite its track record of improving profitability, SYF trades at a steep discount to other companies in the consumer credit industry. Figure 3 compares SYF to several peers in terms of TTM NOPAT growth and price to economic book value (PEBV), which measures the no-growth expectations implied by the stock price. Despite having the second highest NOPAT growth rate over the past twelve months, SYF has the lowest PEBV of its peers. Some of this disparity can be attributed to credit quality, as companies such as American Express (AXP) and Discover Financial (DFS) make loans to less risky customers, but that doesn’t tell the whole story. 36% of Capital One’s (COF) domestic credit card loans are to customers with FICO scores below 660, compared to just 27% for SYF. The market seems to perceive a higher level of risk for SYF than actually exists. At its current price of $35/share, SYF has a PEBV of 0.5. This ratio means that the market expects the company’s NOPAT to permanently decline by 50%. While SYF does face real risks as detailed above, such a scenario seems overly pessimistic. If SYF can maintain a 20% NOPAT margin (below TTM margin of 22%) and grow NOPAT by just 5% compounded annually for the next five years, the stock is worth ~$74/share today – a 109% upside to the current price. After a rough start to the year, where credit quality concerns dominated, SYF has been on a strong run recently. The stock is up 33% from its low in May, and there are a number of other factors that could spur this run higher. A strong holiday shopping season would boost both SYF’s financial performance and overall sentiment for the retail sector. Improved macroeconomic data could reduce fears of a recession or credit crunch. Berkshire Hathaway (BRK.A) could increase its stake or even acquire the company. At the moment, Berkshire holds ~3% of outstanding shares, but it has been adding to its position. An improvement in the company’s executive compensation plan could be a long-term catalyst for SYF. Currently, SYF ties executive compensation to net earnings, efficiency ratio, and loan receivables growth. Net earnings and efficiency ratio both contain the potential for manipulation, while loan receivables only measure growth and not shareholder value. SYF would benefit from tying a significant portion of executive compensation to ROIC, which would ensure capital discipline and a long-term focus on shareholder value creation. Such a change could also have an immediate impact on the stock price. In a recent survey, 77% of institutional investors favored linking executive compensation to ROIC. A change in its executive compensation practices could help SYF attract more interest from large investors. Encouragingly, SYF insiders seem to have bought into the dip in the company’s shares earlier this year. Over the past twelve months, SYF insiders have acquired 286 thousand shares and sold 69 thousand, for a net addition of 217 thousand shares (<1% of shares outstanding). Even though these transactions represent a small portion of the overall volume in the stock, they signify the underlying confidence of corporate insiders. Short interest has relatively little impact on the stock. There are currently 13 million shares sold short, which equates to ~2% of shares outstanding and three days to cover. Income Statement: we made $868 million of adjustments, with a net effect of removing $843 million in non-operating expense (6% of revenue). We removed $12 million in non-operating income and $856 million in non-operating expenses. Our most notable adjustment was the removal of $846 million in non-operating expense due to an increase in loan-loss reserves. 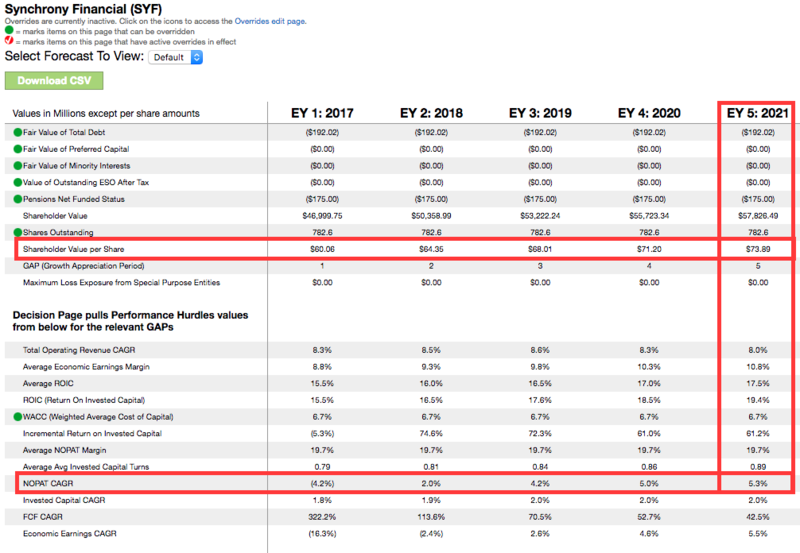 You can see all the adjustments made to SYF’s income statement here. 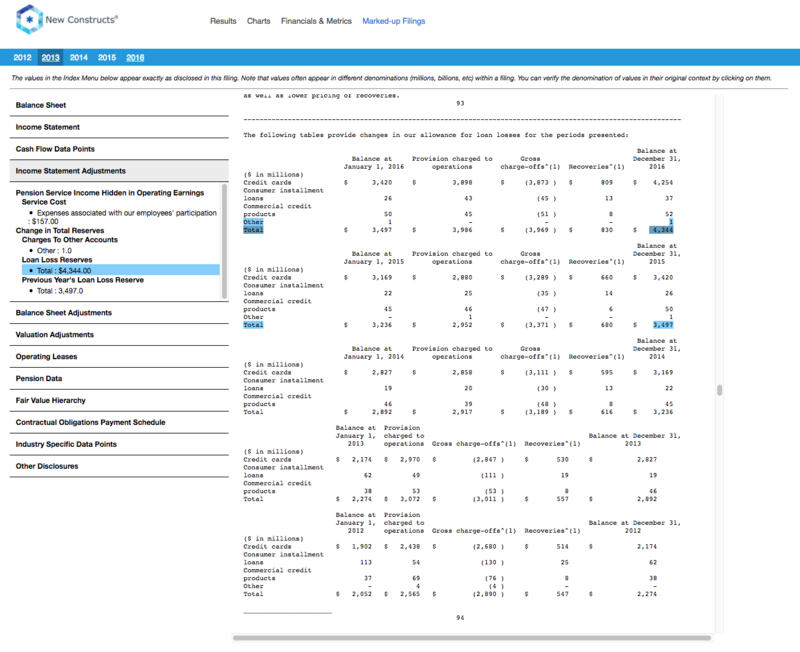 Balance Sheet: we made $4.6 billion of adjustments to calculate invested capital with a net increase of $4.6 billion. The most notable adjustment was $4.3 billion in reserves. This adjustment represented 31% of reported net assets. You can see all the adjustments made to SYF’s balance sheet here. Valuation: we made $367 million of adjustments with a net effect of decreasing shareholder value by $367 million. There were no adjustments that increased shareholder value. The largest adjustment to shareholder value was $175 million in underfunded pensions. This adjustment represents <1% of SYF’s market cap. Despite the decrease in shareholder value, SYF remains undervalued. The following funds receive our Attractive-or-better rating and allocate significantly to SYF. Fidelity Consumer Finance Portfolio (FSVLX) – 6.7% allocation and Very Attractive rating. Morgan Stanley Global Concentrated Portfolio (MLNCX) – 4.5% allocation and Very Attractive rating. This article originally published on November 29, 2017.